Epicurean Cutting Surfaces EPFOOTBALL0301 EPFOOTBALL0301 - Nutmeg / 20" x 12" x ¼"
EPFOOTBALL0301 - Nutmeg / 20" x 12" x ¼"
Epicurean’s Football Board is perfect for tailgating. The “stripes” are handles to make carrying easy, and the etched “laces” serve a dual purpose; they look great and keep your food from sliding around. A generous juice groove captures liquids, keeping your tailgate clean. Color: Nutmeg. Size: 20” x 12” x ¼”. DISHWASHER SAFE – Unlike wood cutting boards, Epicurean Cutting Surfaces can be cleaned in the dishwasher, giving you the best of both wood and plastic properties in one great board. NSF APPROVED – Backed by the national Sanitary Foundation, you can be sure that your nonporous boards will be easy to clean and will not harbor bacteria. KNIFE FRIENDLY – Cutting on the surfaces will not dull your knife so you will sharpen less. HOLE & HANDLE – With every Epicurean Cutting Surface you will find a utility hole or built-in handle designed specifically for efficient handing and hanging. MAINTENANCE FREE – Epicurean Cutting Surfaces are extremely durable and require no oiling or bleaching. 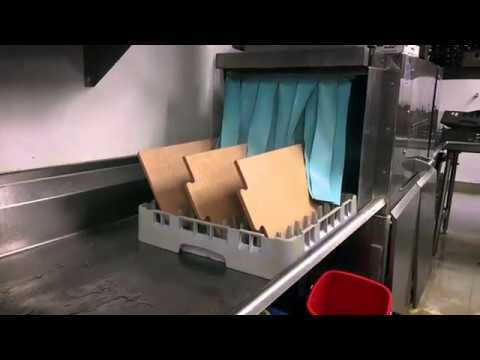 These maintenance free cutting surfaces resist staining and are easily cleaned in the dishwasher. HEAT RESISTANT – Heat resistant up to 350 F, so you can use the surfaces as a trivet without leaving a blemish. EASY ON THE ENVIRONMENT – Epicurean Cutting Surfaces are made with paper from certified US. sustainable managed forest. It’s renewable and natural.